How to read Laudato Si: intention, structure, form and content – Creatio – Adventure in Nature. Journey in the Spirit. In my previous article I already pointed out the 3 salient aspects of Laudato Si: its prophetic style, invitation to conversion and Trinitarian theology. I was going to technically discuss climate change in Laudato si’ vis-à-vis the latest policy and science on the issue. But before I do that, now I find a more urgent need to explain the way one should read Laudato si’, given the amount of perplexed and negative responses (mostly by Catholics) in the media. I find many of these reactions quite embarrassing for so many who call themselves ‘sons and daughters of the Church’; not primarily because they dissent from the Pope, but because of the (poor) reasons they give for doing so. There are many non-Christians who are able to read and interpret Laduato si’ in a much more open, nuanced and sophisticated way, in the same spirit in which it was written. My central thesis in this article is that, for Catholics, embracing the spirit of evangelization as expressed in Evangelii gaudium is a prerequisite for understanding Laudato si’. Most Catholics who oppose Ladudato si’ do so because they have a very limited idea what it means to evangelize. Hermeneutics concern the way in which a reality is interpreted. The way a person approaches a text and engages it shapes how it is understood. Catholics, of all people, should know this – it was over hermeneutics, among other things, how we ended up disagreeing with our Protestant brothers and sisters on the meaning of Scripture. Even with the same exact text, two people can come to very different conclusions about what it means if they chose to interpret it differently with distinct tools and preconceptions. A simple and humorous illustration of the importance of hermeneutics can be found in examples of misinterpretation of ‘The Onion’ articles. These spoof articles are written as comedic satire; for those who ‘read it’ incorrectly their reaction is outrage, fear and perplexity rather than humor. The NYT was so infatuated with Obama they took his PR campaign in Tiger Beat (a tween magazine) enthusiastically, as did the Chinese who believed Kim John-Un was voted the ‘sexiest man alive’. Fox Nation was too eager to viciously repudiate Planned Parenthood’s ‘AbortionPlex’ spoof. ‘The Onion’ requires readers to engage their texts through the hermeneutics of humor. Without this hermeneutic the text cannot be understood as it was intended. Going back to Laudato si’, Pope Francis is very explicit about his intention for the document. 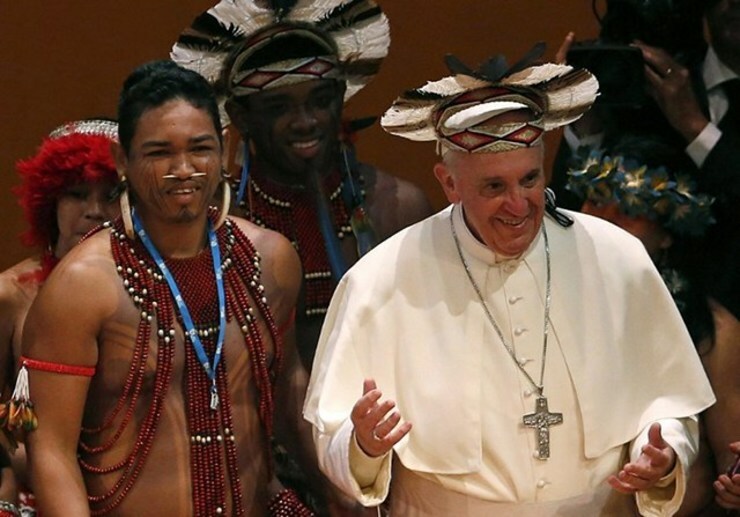 Francis is not writing the encyclical for Catholics or explaining the importance of a missionary hermeneutic like at Aparecida, he is writing it for non-Catholics in a missionary hermeneutic. Laudato si’ is mission itself; the fruit of a missionary approach and an example of how Catholics should engage the world. The Pope explains this in the beginning of the encyclical. a. Intention and target audience: What is the intention of the author of Laudato si’? “I would like to enter into dialogue with all people about our common home” (3). In short, “dialogue with all people”, a “new dialogue” (14) which in colloquial terms could be stated as: ‘I want change the conversation to include everyone’. By invoking Saint Pope John XXIII and the encyclical Pacem in Terris as the point of reference for Laudato si’, Francis is saying 2 things about this “new dialogue”. One, that much like the nuclear crisis in the 60’s, the environmental crisis today is an occasion for people from the whole world to come together. Two, unlike Pacem in terris, Laudato si’ is addressed to an even broader audience that goes beyond “people of good will” to include every person, even those who do not have good will, dislike the Church, etc. : everyone! This is a very bold proposal, especially considering the opposition the Church has faced in recent times. Let us think through what talking to ‘all people’ includes: atheists, conservatives, traditionalists, liberals, rapists, ordinary parishioners, murderers, saints, sinners, celebrities, house wives, Richard Dawkins, humanists, scientists, devil worshippers, do-gooders, heretics, homeless, presidents, vandals, teenagers, moderate Muslims, modern martyrs… My point: engaging the whole world is a fabulous challenge. How does one do this? As we will see, much like Pacem in Teris, this will require on the part of the Church a particular way of speaking, thinking and engaging that may result unfamiliar to Catholics. b. To Catholics reading Laudato si’, Pope Francis reminds them that he gave the Evangelii gaudium, where he encouraged them to do one thing: evangelize. In fact, I encourage all Catholics who are perplexed or frustrated with Laudato si’, to re-read and interiorize Evangelii gaudium (try 15, 27, 34, 35, 41, 48, 49). Let me just give a refresher. In the Apostolic Exhortation, the Pope reminded Catholics of their primary duty to go out and announce the Lord Jesus “first and foremost to those who do not know Jesus Christ or who have always rejected him“ (15), in a practical way. He said that this evangelizing action should be driven by joy and conviction, even if it implies running risks of making the Church “bruised, hurting and dirty”. To Pope Francis, the problem of the Church isn’t the risk of “going astray” or ‘contamination’ from the outside world but rather “a Church that is unhealthy from being confined and clinging to its own security”, “shut up within structures… within rules that make us harsh judges” and that thinks that evangelizing means preaching to our “friends and wealthy neighbors” (48) while “at our door people are starving” (49). No! “Missionary outreach is “paradigmatic for all the Church’s activity” and Catholics should be “permanently in a state of mission”… “so that the Church’s customs, ways of doing things, times and schedules, language and structures can be suitably channeled for the evangelization of today’s world rather than for her self preservation” (27). Get the point? Catholics who do not embrace the message of Evangelii gaudium will not be able to understand Laudato si’ (that is not to say that all who do understand the Apostolic Exhortation cannot diverge and find intelligent objections and concerns to Laudato si’... a few have done so. But a missionary mindset is a prerequisite for Catholics to understand the environmental encyclical). c. Conclusion: What hermeneutic does Laudato si’ call for? An evangelizing hermeneutic. This evangelizing intention of the Holy Father explains the unusual structure of Laudato Si. In the first post I already outlined the Trinitarian theology that holds the encyclical together. This Trinitarian thread is however embedded, serving as a template onto which other attractive and beautiful threads come to the forefront. This thesis is confirmed by the testimony of some of the authors of Laudato si’. This is what the Pope himself said it on the plane flying to Manila in January 2015: “Cardinal Turkson and his team prepared the first draft. Then, with some help, I took it and worked on it, then with a few theologians I made a third draft and sent a copy to the Congregation for the Doctrine of the Faith, to the second section of the Secretariat of State, and to the Theologian of the Papal Household… Three weeks ago, I got their responses back, some of them this thick, but all of them constructive. Now I will take a week of March, an entire week, to complete it. I believe that by the end of March it will be finished and sent out for translation. I think that if the work of translation goes well … then it can come out in June or July. (15.01.2015). This statement by Bishop Toso illustrates two important aspects. The first is that it confirms the evangelizing intention of the Pope, and reaffirms the need to read Laudato si’ in a “missionary key”. What Francis does is to structure the document in a form accessible to non-believers. Second of all, it confirms the thesis that the theology that guides the encyclical, which I call a Trinitarian theology, was not made explicit but implicit for the evangelizing reasons mentioned already. What this says is that at one point the document was a very logical application of social doctrine to environmental issues, but the Pope mixed it up on purpose. What I would say for Catholics that are struggling to understand Laudato si’, they should almost read it backwards, from chapter 6 to chapter 1. The ‘reverse logic’ in fact follows the logic of the kerygma, which we find illustrated in another comment by Bishop Toso in reference to Pacem in terris. The ‘good Pope’s’ encyclical, much like Laudato si’, begins with a language that does not presume Christianity from its readers, introduces ‘God’ progressively and only mentions Jesus Christ a few times, towards the end. As Pacem in Terris, Pope Francis wants to appeal to reason and say that “The principles We have set out in this document take their rise from the very nature of things” (157). Like John XXIII in his encyclical, Pope Francis seems to be following the steps of the kerygma, especially the first two steps (God loves you and sin will destroy you), with the other aspects sprinkled throughout the document. The reason for following the kerygma (see here) is to avoid “Our tendency today… to unload the entire bale of hay, to instruct converts in the whole counsel of Christ, before they are even initiated, and ask that they ascent to all of it” which leads “people to get lost in the weeds, and to miss the essential point.” If the kerygma which is designed for new converts requires a progressive and synthetic approach, how much more care must be put into engaging non-believers. In Laudato si’, Pope Francis sticks to essentials and states the message in a language and style, methodology and structure, that is accessible to his audience. Pope Francis had a wide experience of speaking with non-believers in Argentina; Laudato si’ is the fruit of his experience. One reason many Catholics misunderstand Pope Francis is because they don’t really know how to evangelize, I suspect, because they have not tried it out… beyond their “rich neighbors”. The kerygmatic point would also explain one of the more serious and well founded criticisms of Laudato si’, such as Fr. Schall’s comments that the document is too heavy handed on creation rather than redemption and that it emphasizes “not so much salvation but making a world fit for the poor”. Well, the kerygmatic rationale explains that for an audience to embrace salvation they must first accept creation and sin. Only the lost can be found. The poor are a common ground to begin a conversation… salvation is not that common ground. If we look at Bergoglio’s speech carefully, he was saying these words as a warning to avert making “the Gospel message an ideology”, and turn ‘faith into an instrument’ of our own will. I wonder if the negative reception by many in America is precisely because Pope Francis resists ideological interpretations, liberal and conservative, through his missionary approach. Here we should remember David Schindler’s point where in liberalism, under the guise of hermeneutic ‘neutrality’, the neoconservative position in America is described as the other side of the coin of liberation theology – in which both use Catholicism to achieve their own ends by “keeping God out of worldly affairs”.